Bouchér custom clothing, accessories and home decor accessories are handcrafted in Santa Fe using the finest suedes, leathers, vintage weavings and textiles. Each one-of-a-kind piece is created with old-fashioned attention to quality, workmanship and fit. Bouchér's attention to detail is refreshing in this time of hard-to-find quality merchandise at reasonable prices. Their deerskins are washed and oiled to make them extremely soft and pliable. 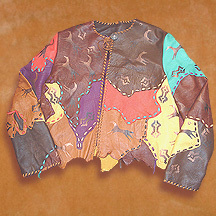 Bouchér custom clothing designs include couture, western, southwestern style and the perennially classic. Each item demonstrates a timelessness and elegance which is always in fashion. The designers and artisans at Boucher also create custom pieces from your design or pattern. 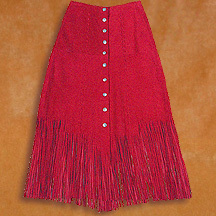 From couture eyelet suedes, to western style suede skirts with hand cut fringe and authentic mercury dime buttons or conchos, youll find every detail to be the highest quality. Custom accessories such as handbags, scarves, shawls, pillows, bed throws and spreads are also made to order. You can request any style or size of pillow in any available color of suede, leather or textile. The fine spreads by Bouchér are all hand-laced and absolutely stunning, especially when made from soft deerskin or shearling.